Not to be confused with Edward Kenna (American football). 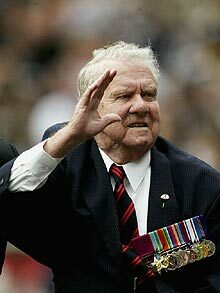 Edward "Ted" Kenna, VC (6 July 1919 – 8 July 2009) was the last living Australian Second World War recipient of the Victoria Cross, the highest decoration for gallantry "in the face of the enemy" that can be awarded to members of the British and Commonwealth armed forces. Kenna served in the Citizens Military Force from August 1940 and was allotted service number V55955. In December 1941, the Citizens Military Force was called up for full-time service for the duration of the war. In June 1942, Kenna volunteered for the Second Australian Imperial Force and was allotted new service number VX102142. He served in the 23rd/21st Battalion in Victoria and later in the Darwin area. In June 1943, his unit returned to Victoria before being sent to Queensland. At this point, the unit was disbanded and its members allotted as reinforcements to other units. Kenna was assigned to the 2/4th Battalion and embarked for New Guinea in October 1944. War Office, 6th September, 1945. No. VX.102142 Private Edward KENNA, 2/4 Australian Infantry Battalion, Australian Military Forces. In the South West Pacific at Wewak on 15th May, 1945, during the attack on the Wirui Mission features, Private Kenna's company had the task of capturing certain enemy positions. The only position from which observation for supporting fire could be obtained was continuously swept by enemy heavy machine gun fire and it was not possible to bring Artillery or Mortars into action. Private Kenna's platoon was ordered forward to deal with the enemy machine gun post, so that the company operation could proceed. His section moved as close as possible to the bunker in order to harass any enemy seen, so that the remainder of the platoon could attack from the flank. When the attacking sections came into view of the enemy they were immediately engaged at very close range by heavy automatic fire from a position not previously disclosed. Casualties were suffered and the attackers could not move further forward. Private Kenna endeavoured to put his Bren gun into a position where he could engage the bunker, but was unable to do so because of the nature of the ground. On his own initiative and without orders Private Kenna immediately stood up in full view of the enemy less than fifty yards away and engaged the bunker, firing his Bren gun from the hip. The enemy machine gun immediately returned Private Kenna's fire and with such accuracy that bullets actually passed between his arms and his body. Undeterred, he remained completely exposed and continued to fire at the enemy until his magazine was exhausted. Still making a target of himself, Private Kenna discarded his Bren gun and called for a rifle. Despite the intense machine gun fire, he seized the rifle and, with amazing coolness, killed the gunner with his first round. A second automatic opened fire on Private Kenna from a different position and another of the enemy immediately tried to move into position behind the first machine gun, but Private Kenna remained standing and killed him with his next round. Three weeks later he was shot in the mouth and spent more than a year in hospital before being discharged from the AIF in December 1946. The following year he married Marjorie Rushberry, a nurse who had cared for him at Heidelberg Military Hospital. After his discharge from hospital, Kenna returned to Hamilton, Victoria. The people of the Hamilton district raised sufficient funds to build Kenna and his wife a house. The Kennas had four children. After the war he worked with the local council and played Australian rules football for the local team. He attended many Victoria Cross reunions in London and led the annual ANZAC Day march in Melbourne. In the 1980s Kenna had his portrait painted by Sir William Dargie and in July 2000 he was featured on a postage stamp as part of an issue commemorating Australia's living Victoria Cross winners. Before his death in 2009, two days after his 90th birthday, Kenna was the last living Australian Second World War VC recipient, and one of only two Australian living recipients of the Victoria Cross, the other being Keith Payne who earned his VC during the Vietnam War. Mark Donaldson was the sole recipient of the Victoria Cross for Australia at the time. Kenna's Victoria Cross was on display at the Australian War Memorial in Canberra for a period in 2010. His family later decided to sell his medals, including the VC, at an auction held at Dallas Brooks Hall in July 2011. Kenna's medal group was sold for a record high A$1,002,000 to an unknown buyer. In 2013, a bronze statue of Kenna by sculptor Peter Corlett was unveiled in his hometown of Hamilton, Victoria. ^ Ted Kenna, VC, obituary, 8 July 2009, Daily Telegraph. ^ "Kenna's VC loaned to War Memorial". ABC News. Australian Broadcasting Corporation. 9 April 2010. Retrieved 9 April 2010. ^ "First WWII Victoria Cross to be auctioned". Retrieved 25 October 2011. ^ "Ted Kanna's VC fetches record $1m at auction". The Australian. 29 July 2011. Retrieved 25 October 2011. ^ "Edward "Ted" Kenna". Monument Australia. Retrieved 2 January 2016. This page is based on the Wikipedia article Edward Kenna; it is used under the Creative Commons Attribution-ShareAlike 3.0 Unported License (CC-BY-SA). You may redistribute it, verbatim or modified, providing that you comply with the terms of the CC-BY-SA.